It doesn’t seem that long ago that we were celebrating the Bicentennial and everything was red, white, and blue. Now, 41 years later, we’re having a bit of difficulty getting along with each other, and with the world at large. 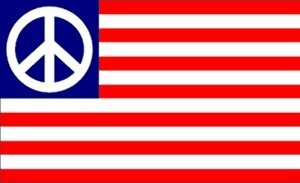 If America can manage to stay together, I propose we adopt a new version of the Stars and Stripes, one that expresses our most important mission for the 21st century: Peace! Happy Fourth, everyone!